Have you guys ever had sweet potato pie? It’s pumpkin pie’s “Black Sheep” cousin. It sounds kind of weird in theroy, but upon first bite you discover it’s absolute deliciousness. A little bit lighter and less filling than pumpkin pie, but still just as festive for Fall. We grow lots of sweet potatoes here on Virginia’s Eastern Shore – most notable, a white-fleshed sweet potato variety called Haymans. You rarely find them off of the Eastern Shore because they’re in such high demand with the locals. I still haven’t been able to get my hands on any this year…I’m hoping to track some down before next week for Thanksgiving, so keep your fingers crossed for me! If you’re worried it might take more time and effort than a pumpkin pie, don’t be – it’s just as easy, with an even shorter ingredient list. It’s one of those recipes that the little ones like to help make too! Plenty of stirring and whisking involved. It may seem strange that there’s no brown sugar or nutmeg – but just go with the lemon extract. It adds such a bright note to the sweet potato, and really makes it sing. So, if you’re looking for a new dessert that’s still traditional – you’ve found it. The perfect addition to your holiday Thanksgiving table that everyone is sure to enjoy! Have a great weekend, everyone. 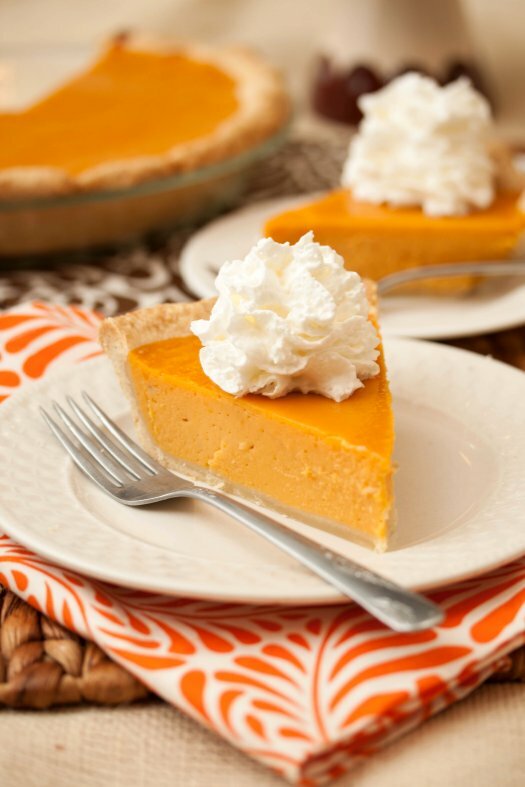 Combine sweet potato puree, sugar, evaporated milk, eggs, flour, and lemon extract in a large bowl. Whisk until combined and smooth. Pour into pie shell and bake for around 50 minutes, until crust is golden brown and the filling doesn’t jiggle. Remove from oven to cool to room temperature before serving. Or refrigerate for a chilled pie. * To make the sweet potato puree: Pierce sweet potateso in a few spots with a fork and microwave at high power for about 10 minutes or roast at 350° for about 1 hour, until tender. Let cool slightly, then peel and puree in a food processor. Can’t beat pie of any flavor. I love this kind of pie because its so cream to my tongue and also is a most excellent excuse for whipped cream. Your pie is really mouth-watering! This is the BEST sweet pie ever! I am making a few of these for our big family Christmas dinner.